Store foods at safe temperatures to prevent food spoilage and avoid food borne illnesses with the AcuRite Digital Refrigerator Thermometer and Freezer Thermometer with Temperature Alerts. The digital display features the refrigerator temperature, freezer temperature and the high / low temperatures recorded for each. A programmable alarm notifies you audibly and visually when temperatures exceed your preset minimum or maximum temperature range. 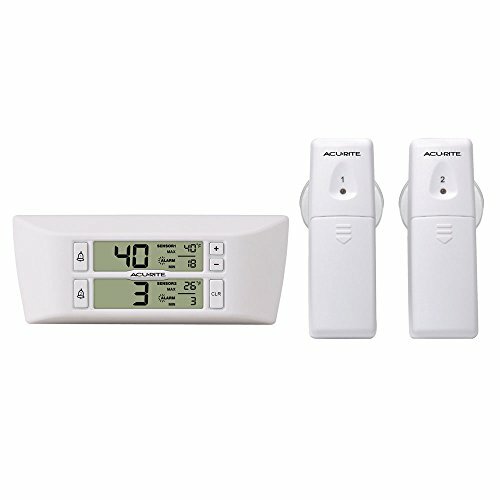 The thermometer display has a magnetic backing to stick on the fridge or an integrated keyhole for easy wall-mounting. The thermometer includes one wireless refrigerator thermometer and one wireless freezer thermometer that feature a wireless signal indicator light, and versatile mounting options including an integrated suction cup or spring-loaded clip. Thermometer display is powered by 2 AAA alkaline batteries (not included). Sensors are each powered by 2 AA alkaline or lithium batteries (not included). Lithium batteries recommended for use in sensors for temperatures below –4 degrees Fahrenheit (-20 degrees Celsius). One-year limited warranty. It's more than accurate, it's AcuRite.